Congress has scheduled a vote TUESDAY to eliminate Internet privacy rules and allow ISPs to sell your data to advertisers without your permission. It already passed the Senate. This is our last chance to stop it. Just last week, the Senate voted to gut internet privacy rules that prevent Internet Service Providers (ISPs) from selling your sensitive personal information to advertisers without your consent. The measure passed the Senate by only two votes. It was close, and there was significant public outcry which means we still have a chance to stop it. Now the bill moves to the House of Representatives, and we just got word that they scheduled a vote on it TUESDAY. They’re trying to ram it through quickly without discussion or debate. We need to stop them. Call Congress right now. Tell them to vote NO on repealing the FCC broadband privacy rules. Even creepier, they’ll be able to install software on your phone to track you, and inject undetectable “cookies” into your Internet traffic to record everything you’re doing online. If this bill passes the House, companies like Comcast, Verizon, and AT&T will be able to constantly (and secretly) collect our online activity and sell our browsing history, financial information, and real-time location, and sell it to advertisers without our permission. New Hampshire has made strides in bringing better connectivity to unserved areas with projects like New Hampshire Fast Roads, but for years one factor has held them back: state law limitations on municipal bonding for Internet infrastructure. Once again, a proposal to change the law is in the state legislature. SB 170 proposes to eliminate the one provision in New Hampshire law that has prevented municipalities from bonding for Internet infrastructure - the requirement that the infrastructure can only serve properties where there is no existing service. By blocking access to funding, the requirement has prevented projects that might bring service to whole communities when small pockets of service already exist in those communities. The House companion bill, HB 191, passed the Science, Technology and Energy Committee but died when brought before the full House for a vote. The bipartisan vote against the bill was 193 - 168, emphasizing that the issue of connectivity is not related to political party. SB 170 was heard in the Senate Public and Municipal Affairs Committee in early February and, even though a number of individuals and organizations from communities in effected towns spoke on its behalf, a motion was presented to kill the bill. We’re happy to report, however, that the motion failed and the bill was rereferred to the same committee. It’s been sitting there ever since. In other words, it’s still alive, but it may not be picked up again unless committee leadership feel motivated to do so. Tell Them, "It's About MY Hometown"
Today at noon, Congress is expected to vote on whether to gut the FCC’s broadband privacy rules that prevent Internet Service Providers like Comcast and Verizon from collecting and selling your personal data without your permission. In just a few hours Congress could roll back these landmark rules that many of us fought hard for last year. And get this-- the 22 senators behind this controversial resolution have received more than $1.6 million from the very same companies that would profit from us losing our broadband privacy rights. We can’t let this happen. Call Congress right now. This is going to be a close vote. We’ve included the names, numbers, and twitter handles of key members of Congress who could vote to uphold current broadband privacy rules. This vote is happening very soon, please call or contact these key members of Congress now. Earlier this legislative session, we followed legislation in Virginia, which would have negatively impacted municipalities’ ability to use their publicly owned infrastructure to improve connectivity. We’re now watching a bill in Missouri that’s been resurrected from legislation that died last year. Another state bill just appeared on our radar in Georgia that interferes with local community authority by prescribing stringent rules on permitting and applications. This is based on the false notion that cities are the barrier to better networks rather than recognizing the power of pole owners and existing attachers as a far more significant barrier. The bill, HB 336 or the Broadband Strategy for All of Georgia Act, allows communities to be certified as “broadband ready,” which may allow providers that serve those communities eligible for state tax incentives. In order for a community to be certified as a “broadband ready community,” it must comply with a specific model ordinance, created by the state that dictates the process for reviewing applications for broadband projects. 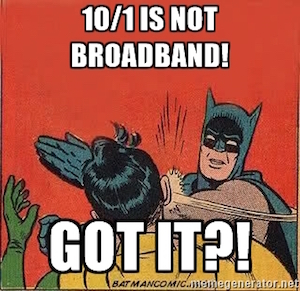 The bill starts out all wrong, by defining broadband as 10 Megabits per second (Mbps) download by 1 Mbps upload. Clearly that indicates that its point of origin is the incumbent telephone companies who want to make it easier to provide their slow DSL, rather than encourage upgrades to the FCC definition of “broadband.” As a reminder, the federal government considers broadband to be 25 Mbps / 3 Mbps.